I was able to use 1 6′ 1×4 board that I ripped down to 1″ wide pieces and 2″ wide pieces. I did have to use about 6′ of 1×2 board ripped to 1″ from scraps to finish framing out the top of my console. After using the cube bookcase for years with feet screwed into the bottom, I discovered that the bookcase sagged without support at each cube wall. 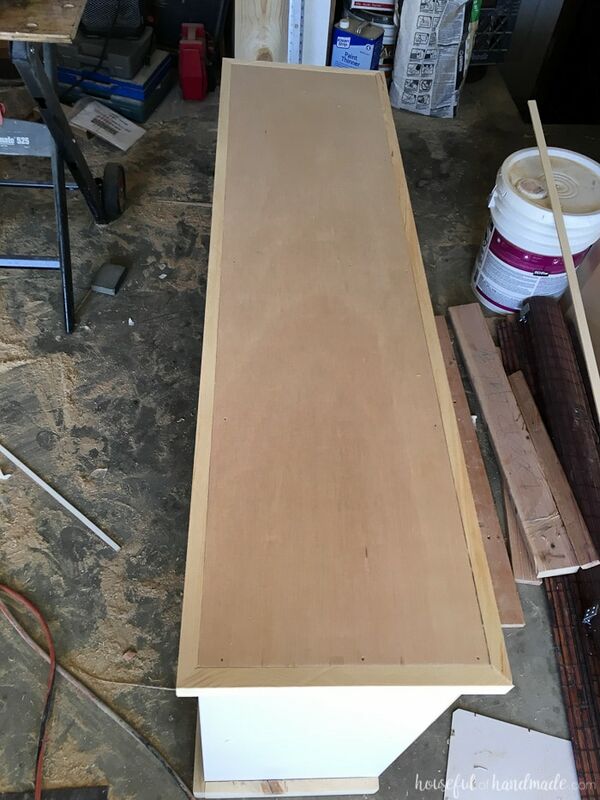 Using the 2×2 board, create a base for the bookcase. 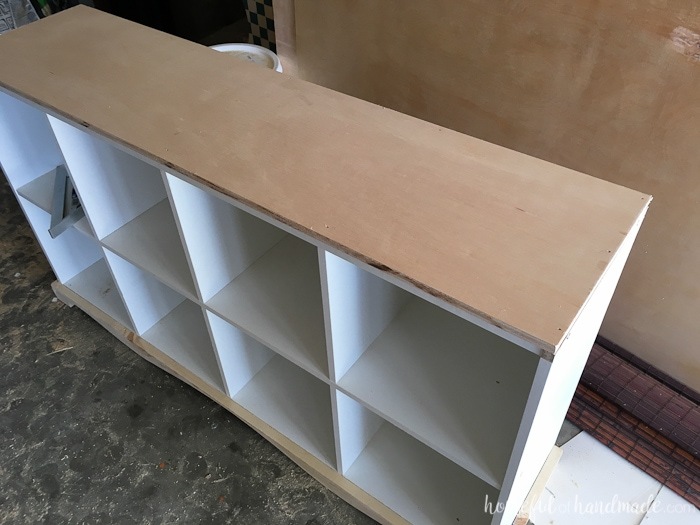 Cut 1 board to the width of bookcase and secure to the back, cut 4 boards to the depth of the bookcase minus the board on the back and secure under the cube walls. Originally I used left over construction adhesive, but then when I moved the bookcase outside to finish the transformation, some of the base pieces fell off. Apparently the adhesive did not work well on melamine. So I reattached the base with my nail gun and lots of nails. I also left the center support board short (about 1/2 of the depth of the bookcase) so that it would fit nicely over my heater vent and allow me to make the front really pretty. 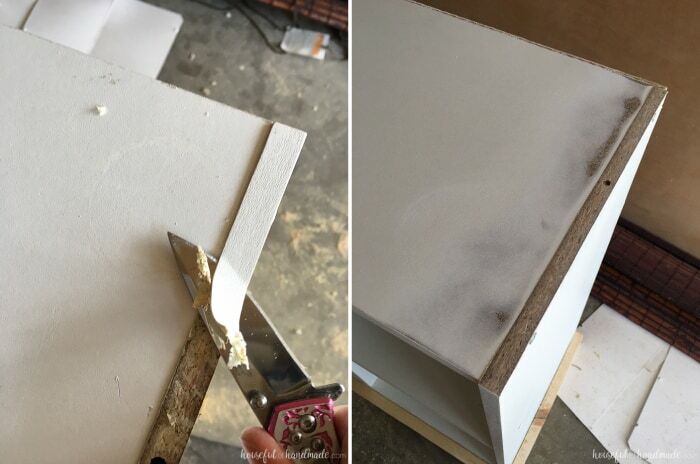 Trim out the sides of the base with 2″ wide pieces of wood (not 1x2s but wood ripped to 2″ wide). You can also see I cut off the white laminate on the side of the bookcase where I would be adding the front of the base trim. This will allow it to lay flat against the rest of the bookcase and was easy to do with a utility knife. 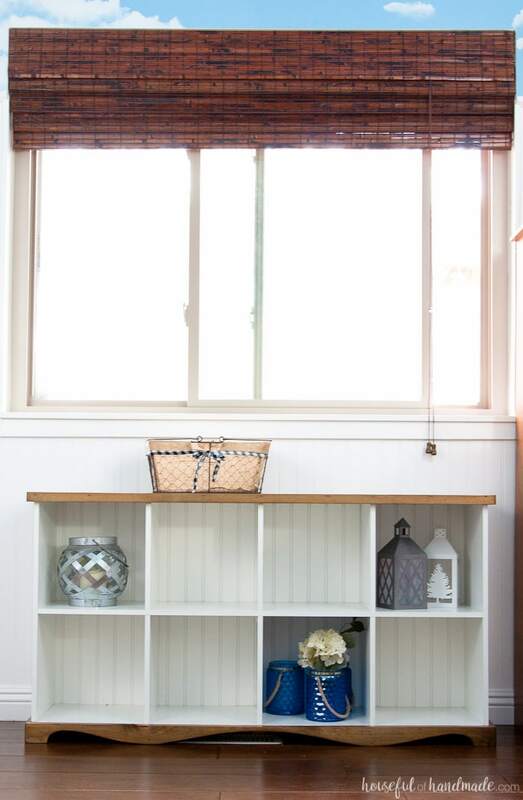 Measure the front of the bookcase and cut a piece of the 2″ wood to fit. Then it’s time to design the decorative base. Start by marking where the 2×2 boards would be visible, then draw your design to cover those areas. 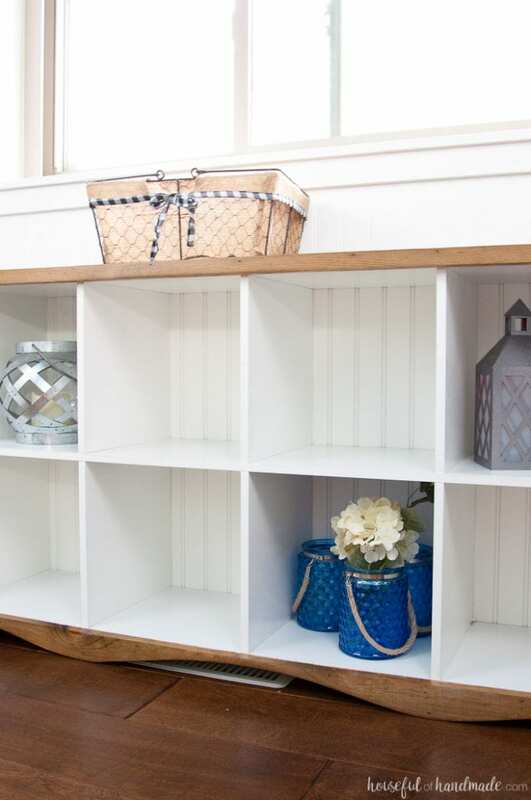 Cut it out with a jig saw and attach to the front of the bookcase with your nail gun and finishing nails. Now flip it over and admire your work! It already looks so much better than before. Next it’s time to tackle the back. My bookcase had cardboard covering 4 of the 8 cube areas, two of which had been removed sometime in the last 6 years. Remove these cheap backings and replace it with a piece of beadboard cut to fit. I happen to have a lot of 2′ pieces of beadboard in my garage since we added beadboard to only 6′ of the walls. I also used some of these small pieces in my dining room bench. See it pays to never throw anything out! Before adding the top, make sure the top of the cube bookcase is level. This will ensure a level console top when finished. I removed the white laminate and sanded the edge so it was flush. 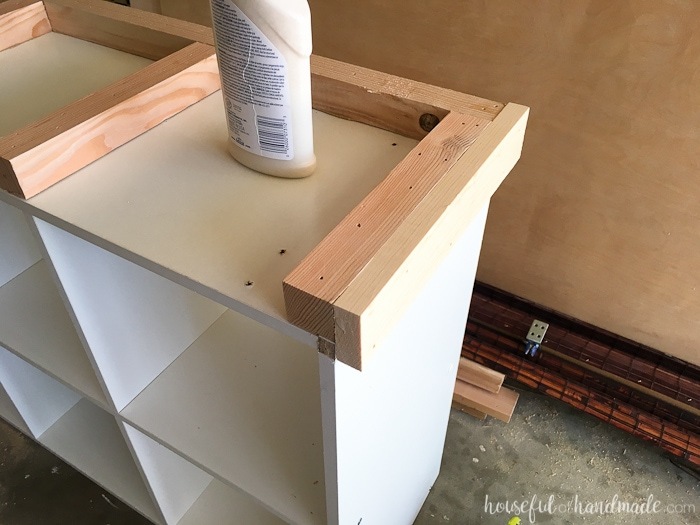 Cut a piece of 1/2″ plywood to fit the top of the bookcase and secure with finishing nails. Be careful not to just nail into the top or you may have nails sticking out all over. Nail into the top and into the cube walls so the ends of your nails stay hidden. Trim out the edges of the plywood with wood ripped to 1″ (my cube bookcase top was 1/2″ and the plywood was 1/2″). I chose to miter the corners here, but your could keep it simple and trim it out like the base. Now all that is left is to finish the piece. Luckily you do not have to do anything to the white melamine except maybe give it a good cleaning! Stain the base and the top and protect it with 2-3 coats of poly coating. I used a natural stain made out of steel wool soaked in vinegar and black tea, then finished it off with a satin polyurethane coating. My new farmhouse console table DIY is the perfect piece to hold all those decor pieces that I use to decorate my home throughout the year. I also might be using it to store some crafting items, but first I need to pretty up all the coffee boxes I have been saving and get to organizing. That alone will probably take me 3 days. 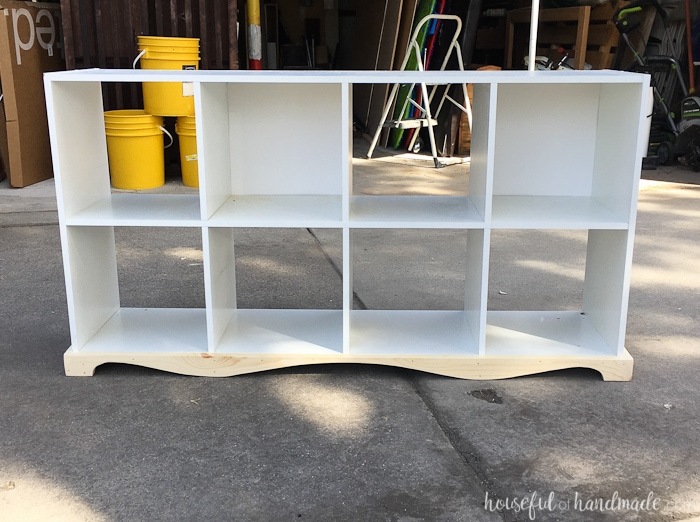 So what do you think of my $5.50 cube bookcase makeover? I still can’t believe how much more expensive this basic piece looks. 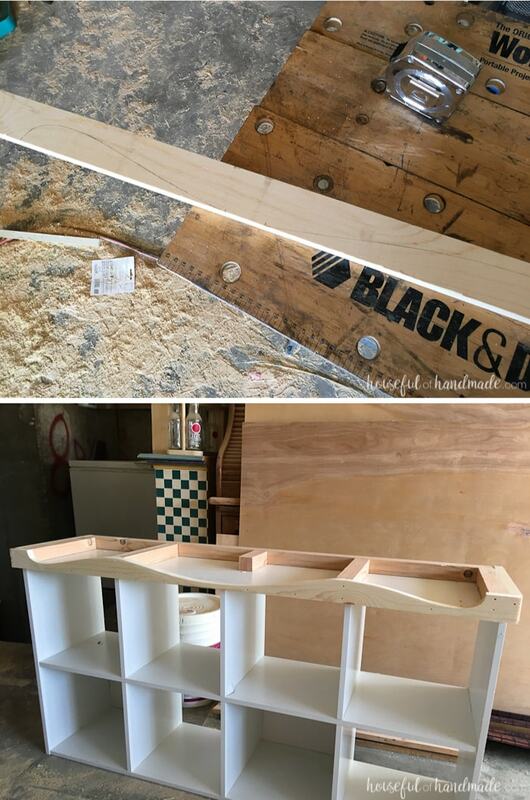 Now it is a custom Farmhouse Console Table DIY. And now off to finish this room, it has to be done in just over a week! Beautiful! Can you let me know how you hid the holes made by the nails on the top shelf? You can always fill the holes with wood putty, if you plan to stain it you need to make sure to pick a stainable wood filler. I like the tiny little metal heads so I leave them visible. With the darker stain they just disappear but give it a rustic look. Awesome job! 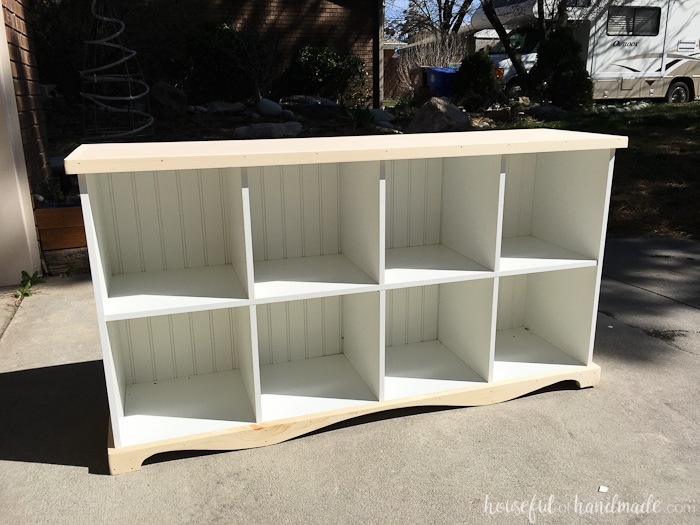 Now I want to get me a cheap bookcase to DIY!